No play possible, wet outfield. Worcestershire's opening County Championship Division Two game against Kent has been washed out for the third day running at New Road. The already saturated ground was topped up by further overnight rain. Following a 12:30 BST inspection, match umpires Ian Gould and Richard Illingworth had no option but to abandon play again. And given the forecast for Wednesday, it is unlikely that there will be any play on the final day either. Meetings between Worcestershire and Kent have been blighted by bad weather since Worcester's great flood in 2007. All four days were lost at New Road, as was the case in the next home game against Lancashire, and only the final day's play was possible in the return Kent-Worcestershire game at Canterbury later in the season. Also, in 2014, the last time the clubs met in the Championship, at Tunbridge Wells, only 17 overs were bowled on the final three days. 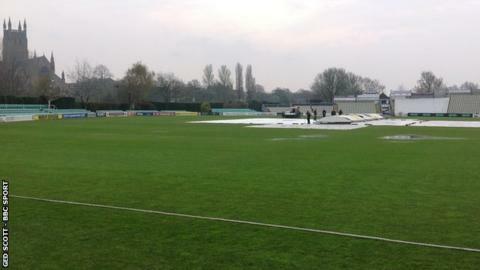 "The ground was playable on Friday. If anything, the rain on Saturday afternoon was a lot heavier than anticipated. "That probably topped it up to the levels where it was touch and go on Monday as to whether the players would get on. "But there were just areas of the ground where, the best way to describe it, was that it had turned to like a jelly-blancmange. "When you put your foot down, it wasn't actually wet on the surface but the ground was starting to move because of the height of the water table."